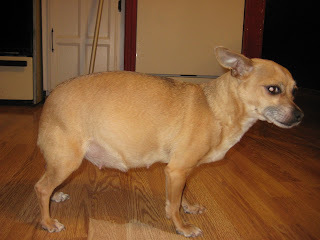 Eric has been calling her the Hindenburg lately, because he thinks she looks like a blimp! Just a little over two weeks to go before there are new babies in this house!!! And this is what happens after a Paris and Remy eat a meal. I am mixing their food right now so there is two kinds. 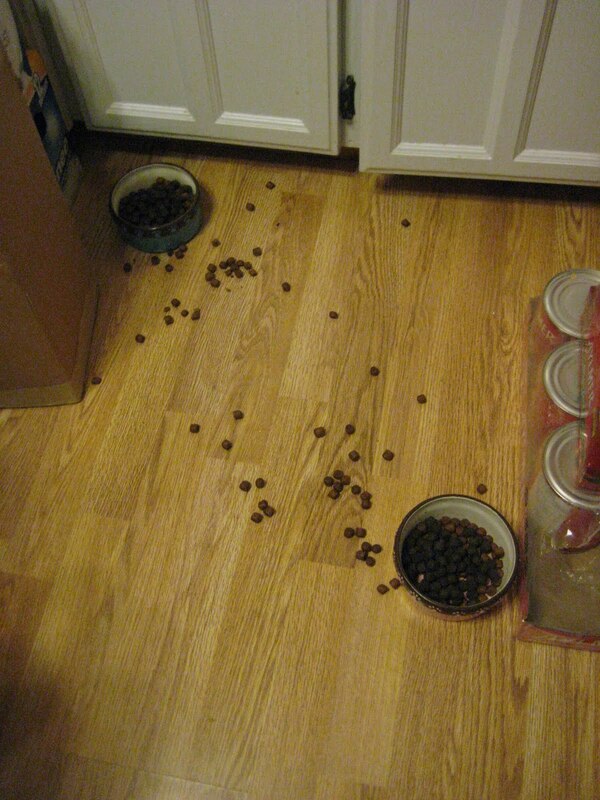 They pick up a mouthful and drop it on the floor, then pick out the new kibbles and leave the old! Then I am left with this mess to clean up. But I have a confession. I will not clean it up.I will leave it there until they eat it. Because the bowl will get empty eventually, then they will have to eat the food off the floor!! Maybe it is too much food per feeding and that is why they are not finishing it/looking for the new food and not eating the old? Or maybe they don't like one of the blends? About a year ago, Banana started putting her foot in her bowl and making food go everywhere (although she would eat it right then), but we didn't want to tolerate that kind of eating behavior...we switched foods and reduced her portion size, and she is back to eating without making a mess! Aww, Paris is SO cute - bet you can hardly wait for those precious babies to arrive! !